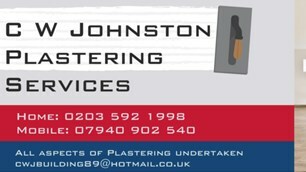 C W Johnston - Plasterer based in Worcester Park, Surrey. Director of C W Johnston Plastering Services, we are a family run business, trading for 15 years now, having taken all my fathers knowledge and skills in the trade, this is what makes us different from the rest. We pride ourselves in our ability to carry out jobs to the highest standard, being honest, reliable and trustworthy insuring there is minimal disturbance whilst your works are being carried out, enabling you to get on with your day with no hassle. We cover a wide range of services that we offer here at C W Johnston Plastering Services these include both internally and externally here are just some of the services we have to offer re skimming, patch repairs, plasterboarding, coving, traditional sand and cement rendering, k-rend, monocouche rendering, pebbledashing to name a few.